yellow warblers nesting in the honeysuckle bush. The other day I stuck my head in the bush. each other, startled by our existence. of bumblebees, they’ll fly to Costa Rica without a map. From time to time, I am sucked into a black hole where I find myself binge-watching shows I have no business enjoying. A few days ago, for instance, I finished watching the fourth and final season of Rush — a popular Australian TV police drama focused around Melbourne’s Critical Incident Response Team (CIRT). Right after, I began counting the life-hours I had lost. While “far-fetched” and “dopey” don’t begin to describe this series, I realized that what captivated me most about the show was its noticeable lack of violence, at least of the sort to which we Americans have become accustomed. Sure. There were the requisite carjackings, explosions, knifings, dirty bombings, and more — you know, the kind of fare that no longer makes you flinch when you watch these barbarisms on American TV. Still, I was struck by how peaceable and gun-averse the Australian police in this show were — even when in the gravest of dangers. I was struck, too, by how they did everything they could to de-escalate a situation and to subdue a criminal by using such non-lethal weapons as tasers, bean bag rounds, and pepper spray before they resorted to using guns with real bullets. The pacifism reflected in this TV series is no surprise, though, when you consider the strict national gun control laws passed by former Prime Minister John Howard after the 1996 Tasmania massacre that left 35 people dead and 23 wounded. Such laws seem unlikely in this country, however, given the power of the NRA and the strength of its influence over Republicans in Congress. 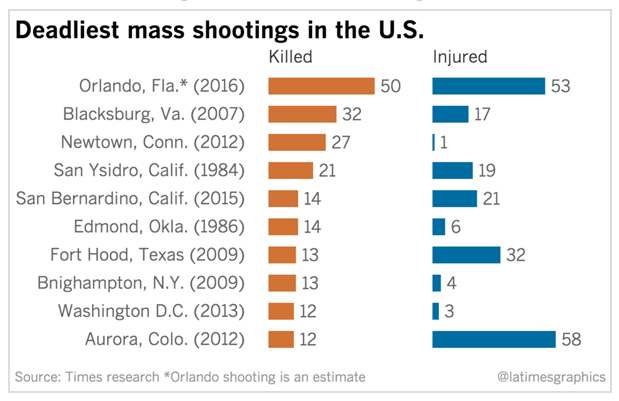 Why, we can’t even get Congress to ban terrorists on law enforcement watch lists from buying guns despite this weekend’s Orlando killing spree, in which a known IS sympathizer who had been questioned several times by the FBI murdered 49 beautiful souls and wounded 53 others. Children now being raised in Australia will not even have a frame of reference for the kind of violence we in the United States have come to accept as a given: Since the 2012 Sandy Hook tragedy, where 20 children between the ages of 6 and 7 as well as 6 school staff members were murdered, there have been 998 mass shootings. What more has to happen, I wonder, before we can remove from power those who condone gun violence and who do everything they can to block commonsensical gun control laws? When she was 49, my brother’s first wife—a blonde-haired, green-eyed, freckled beauty—drove her car off a Los Angeles cliff. When she was young, her father Jack was the one to find his wife, her mother, who had also killed herself, and during the years I knew Carmen she more than once wondered aloud if that would be her own fate. I have held onto a few things that help me remember the kind of person she was: a cookbook with a bright pink cover, which had been one of her favorites, and two papier-mâché containers decorated with a jungle theme, where I keep paper clips and push pins. Sometimes when I am sitting very still, I find myself thinking about Carmen’s last moments, right when her car went over the edge and there would have been no turning back. I try to imagine myself flying through the air with her just long enough to be assured that she did not suffer. But I am never able to stay in the front seat with her for more than a few seconds before my psyche recoils. My gentle niece, who was young herself when her mother took her own life, has been left to imagine and grieve that terrible death for the rest of her days, and I cannot think that anything would diminish the pain of her loss, not even time or love.